A defense that includes former All-Pros Shawne Merriman (#56) and Nick Barnett has fans excited in Buffalo. All of a sudden Buffalo Head Coach Chan Gailey and General Manager Buddy Nix are starting to look like geniuses. 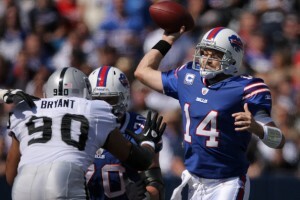 Until a week ago, even the most loyal, optimistic Bills fans were being tempted to doubt. After a mostly dismal pre-season, the popular prognosis for the Bills ranged from regression to no improvement to a 6-10 record at best. But then Buffalo spanked the Chiefs 41-7 for their most lopsided opening day win since the O.J. Simpson era. Quarterback Ryan Fitzpatrick had a nearly flawless game, and the Bills defense was looking like a cross between the classic Purple People Eaters and the Steel Curtain– or maybe– the much heralded “No-Name” Dolphins defense of the ‘70’s. It was impressive and surprising for everyone. From the most subjective Bills fan to the most jaded pundit, everyone was left speechless– except, perhaps to say, “Wow!” In fact, one NFL journalist had predicted a 42-7 score favoring Kansas City just days before the season opener. Wow! No, really. Wow! But of course the question was, how real was that? Was it a fluke? Could the Bills repeat the performance against another tough running team like the Raiders? Certainly not, most handicappers insisted. Even The Buffalo News predicted a 20-14 loss. And then, as the home opener commenced in front of a sold out Ralph Wilson Stadium, and Oakland jumped out to a 21-3 halftime lead, most people– even the most loyal fans, if they were to be honest– had to be thinking the Chiefs game really was a fluke. Well, at least that’s what I was thinking, hard as I tried to stay hopeful. But then the second half started and a football game broke out. Bills fans began to wonder where the real Bills had been hiding in the first half, and who were those imposters spotting the Raiders 18 points? The team that took the field in the second half came out with a vengeance, scored 21 unanswered points, and then got into a barn burner of a shootout that reminded those of us who are old enough to remember, of a Monday night game in 1974 when the Bills beat the Raiders at home, after exchanging touchdowns twice in the final minute of the game. Which 2-0 team will win the most games? 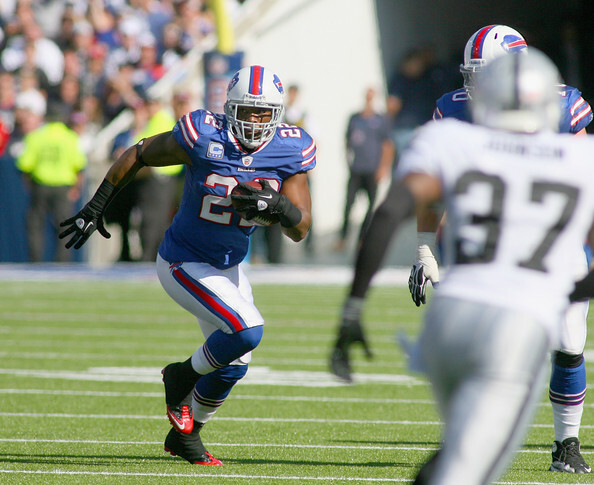 That had been a real breakout moment for the Bills in the O.J. Simpson era. That was the game that established the Bills as legitimate contenders for the first time since Jack Kemp and Cookie Gilchrist tore up the field. Ryan Fitzpatrick led the Bills to an improbable second half comeback against the Raiders. So now, after averaging nearly 40 points a game in the first two games, after coming from behind four times to beat an impressive, upwardly mobile Raiders team, after earning 34 first downs (the NFL record is 39), the Bills have answered the first question. No, it wasn’t a fluke. Now there’s a whole new question to address. They’re apparently pretty good, but how good are they? Good enough to break .500? Although nothing is certain and in the NFL fortunes change faster than on Wall Street, it seems a winning record is a better than even bet. But how good are they really? Could they be a playoff team? And at the risk of either jinxing them, sounding like an idiot, or both, I’m going to verbalize it—could they win the Super Bowl? At the risk of jinxing the team and exposing myself for the shameless homer that I am, I am going to suggest that they could and indeed may win the Super Bowl. My reasoning is simple counter-intuitiveness, plus an understanding of what I call symmetrical destiny. Think about it. The Bills had one of the best teams ever assembled in the early 90’s. They are still the only team in NFL history to win four consecutive conference championships, and thus make four consecutive Super Bowl appearances. In at least two of those four years, the Bills were the consensus best team in football. Yet, despite all that talent, the Harvard genius of Head Coach Marv Levy, the law of averages that says that any team making repeat appearances in a championship game is increasingly likely to win with each repetition, they failed to win even once, and then the team gradually broke down until hitting what appears to be bottom with last season’s 4-12 record. So, if that great Bills team of Levy, Kelly and company was unable to win a Super Bowl, the rule of symmetrical destiny would predict that if a Buffalo team is ever to win the Lombardi Trophy, it won’t be another dream team. It will be a motley gaggle of no-names, coached by a no-name retread, and quarterbacked by a Harvard geek who is a consensus backup at best—until he’s not. And the better Fitzpatrick looks, the better Chan Gailey and Buddy Nix look for sticking with him, for bolstering his confidence by refusing to draft one of many blue-chip quarterbacks in the most recent class. Nix and Gailey seemed to sense that by naming Fitzpatrick the starter long before training camp, they would give him the bump he needed to come out hot and keep on burning. Against the Chiefs Fitzpatrick was near flawless. Even more impressive, however, was the way he took control of the Oakland game in the second half, the way he brought the team back with him by sheer will, the way he overcame mistakes, misfires and lost leads, over and over, and capped it all off with a clock-managing drive at the end that sealed the win. Chan Gailey has been known for developing quarterbacks, getting the most out of lesser talents. With Fitz we can add the ability to bring out the superior talent from one who has only displayed mediocre skill under previous regimes. Add Gailey’s creativity, intuition, and respect for his players, and suddenly you’ve got a lot more than anyone expected when the coach was first introduced. The bond and chemistry between Gailey and Fitz has made not only made Fitz what he is, but has helped Fitz create the same kind of chemistry with, and bring the same level of greatness from his no-name arsenal. And though it was hard to believe as recently as the final week of pre-season, it is becoming obvious that the decision not to draft a quarterback, to focus draft choices on defense, to roll the dice on the offensive line, and to trade Lee Evans for a future fourth-rounder were all strokes of genius. Each move was the computation of another chemical equation, all of which designed to make just the right combination of talent, character, commitment, and compatibility. Fred Jackson is showing that he can be a dependable featured running back. It is becoming obvious that despite their strong backwater accents, Buddy Nix and Chan Gailey are no hayseeds. And the team they have so ingeniously mixed and shaken and stirred—all under the radar—is a real barn burner. There were glimpses of brilliance last season that suggested there might be a little genius hiding in that hayseed act of Buddy and Chan. But now, after two games in their second season, I’m convinced of it. No matter what happens the rest of the year, I’m convinced that these two guys belong together, and that Ryan Fitzpatrick belongs with them, and that between the three of them, the No-Name roster that the hayseeds have assembled and that the Harvard kid is leading could be destined to win it all, much to the shock and outrage of every large market team and the millions of dollars they have overpaid for stadiums and marquis talent. Speaking of the Harvard kid, as Marv Albert said last Sunday while broadcasting the Bills-Chiefs game on CBS, “football is the only profession where being a Harvard grad is a liability.” But Ryan Fitzpatrick is smart enough and talented enough to turn the liability into an asset. What he can’t do with Manningesque finesse, he does with brains, grit, passion, and faith. Faith in himself, his coaches, his team. Fitzpatrick was quoted this past week as saying he has “the most talented receiving corps that no-one has ever heard of.” I’d take that a lot further. He has the most talented general manager, head coach, and team that no-one has ever heard of. And before the year is over, if he hasn’t already, Ryan Fitzpatrick will mute his critics, prove his status as a franchise quarterback, and very possibly achieve what great Buffalo quarterbacks from Joe Ferguson to Jim Kelly could not. Earlier I alluded to the No-Name Defense, the anonymous guys who led Miami to its first playoff seasons. 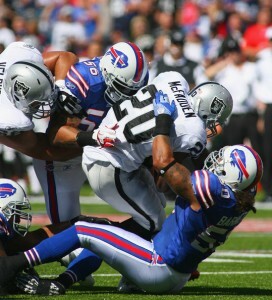 The 2011 Buffalo Bills have seen the No-Name Defense and raised it. And what most of us love the most about competitive sports on any level, and about the NFL in particular, is that more often than pure statistics might predict, teams of lesser talent and prestige triumph on any given day, and in any given season. And I’m ready to assert that this year’s Buffalo Bills will continue to amaze and confound the pundits, their opponents and even their fans for the rest of this season because the chemistry being created by the hayseeds and the Harvard guy is pure magic. And if you believe in magic, anything can, and often does, happen. John Wingspread Howell is an entrepreneur and free-lance writer living in Buffalo, New York.